Technology companies often attribute their success to a strategic “pivot” that saw them de-emphasize an early business in favour of what ultimately proved to be a better idea. The burgeoning cannabis sector now has its own example in the form of The Canadian Bioceutical Corporation (CSE:BCC), which shifted its focus to the United States after identifying cultivation opportunities it could advance much more quickly than its founding project in Canada. Through a strategy of acquiring existing businesses and providing capital and management expertise to accelerate their growth, the company has positioned itself to be profitable early in its young life. With its first acquisition, completed in January 2017, The Canadian Bioceutical Corporation acquired highly profitable assets in Arizona. These were only consolidated as of January 1, so their contribution to the company’s full financial year, which ended March 31, will be limited. Still, they will provide a good indication of what can be expected in coming quarters. The Arizona assets are the first of several that chief executive officer Scott Boyes is working to bring under the company’s umbrella. 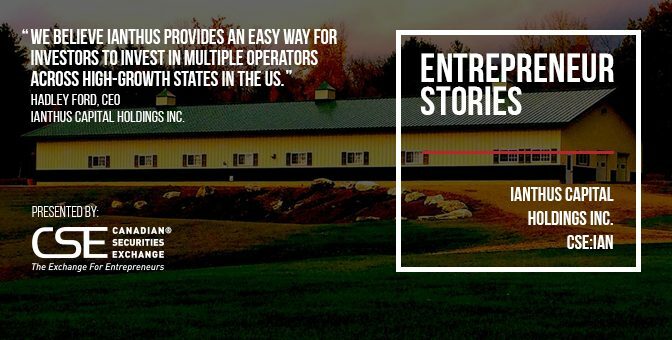 The plan is to move quickly, setting up shop in states where risk is quantifiable and businesses are available at valuations that allow for multiple expansion as capacity is expanded on both the production and distribution fronts. Boyes shares that the Arizona deal cost US$25mln, and was concluded at around 1.5 times revenue and 4 times cash flow, undeniably reasonable metrics for a business in the super-hot cannabis sector. The Canadian Bioceutical Corporation gained more than just operating assets, as Boyes was eager to work with the executive who had built the Arizona business, Beth Stavola – so much so that Stavola is now president of the company’s US unit, CGX. Purchasing the Arizona assets was an easy decision based on the results of extensive due diligence, which included an audit by a Canadian accounting firm and other assessments. Boyes explains that Arizona laws dictate medical cannabis operations must be owned by non-profit organizations, and therefore The Canadian Bioceutical Corporation does not cultivate or sell cannabis products itself in states with this type of legislation. Rather, the company purchased management, real estate leasing and other entities providing support to the licensed cultivation and retail operations under long-term services agreements. Because the owner of the license and facilities is a non-profit, the cash left over after operating costs flows to the service providers. The company also holds another license that will enable it to open a third Arizona dispensary, which is currently in development. All three will operate under the Health for Life (H4L) banner and carry, among other products, the award-winning Multiple Extracts (MPX) brand Stavola established. One final note on Arizona is that legalization for adult recreational use is off the table right now, following a November 2016 vote on Proposition 205, which proposed legalizing cannabis use for people 21 years of age and older. The “No” victory was far from overwhelming, with the vote decided by a margin of fewer than 3 percentage points. The company’s second big acquisition of 2017 is taking place in a state where voting in November approved recreational use. In early April, The Canadian Bioceutical Corporation announced a Letter of Intent (LOI) to purchase a 51% stake in Massachusetts-based IMT LLC. The deal will take place via CGX using a services company structure similar to that employed in Arizona. Assets include a 40,000 square foot facility zoned and licensed for cannabis cultivation and a license to open up to three medical cannabis dispensaries. Annual capacity is an impressive 2,500 kg of cannabis and 500,000 g of concentrates. The first dispensary, in the city of Fall River, will be adjacent to the cultivation facility. The acquisition calls for a US$5.1mln cash payment to IMT LLC and a further US$2mln in capital to build the second and third dispensaries. Massachusetts could begin licensing dispensaries for recreational sales as early as January 2018, with preference given to medical-use locations already up and running. In early May, The Canadian Bioceutical Corporation announced it is moving into a third market, as it is acquiring 100% of GreenMart of Nevada, a licensed cultivation and wholesaling business based in Las Vegas. The growing facility is fully operational and can produce 1,600 kg of dried cannabis per year plus 85,000 g of concentrate. Total cost is US$19mln, payable half in units of the company and half as a non-interest bearing promissory note. Boyes notes that while Nevada’s population is less than three million people, over 42 million tourists visit each year, so with voters having recently given the green light for recreational use the total market could be very large. Completing over C$50mln in acquisitions during the first half of 2017 would be quite a feat, and a US$25mln line of credit the company secured in May will play an important role. It will also help to limit dilution; the company stated its intent in late March to raise US$20mln by issuing new shares but decided to raise less (the book was closed at US$11.2mln) because the line of credit can cover a substantial portion of near-term spending. While Boyes says the Canadian cultivation license for its facility in Owen Sound, Ontario, is still something the company would like to obtain, the focus for now is definitely the US, where he says more acquisitions can be anticipated this year. Boyes has been somewhat surprised that his company has not achieved the valuation multiples enjoyed by some other public cannabis issuers in Canada, but thinks this will correct itself over time as investors become more comfortable with businesses operating south of the border, where on a federal level the possession of cannabis remains illegal. 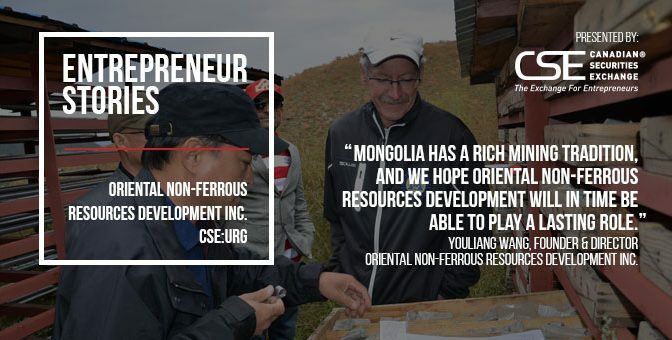 This story was originally published at www.proactiveinvestors.com on May 8, 2017 and featured in The CSE Quarterly. 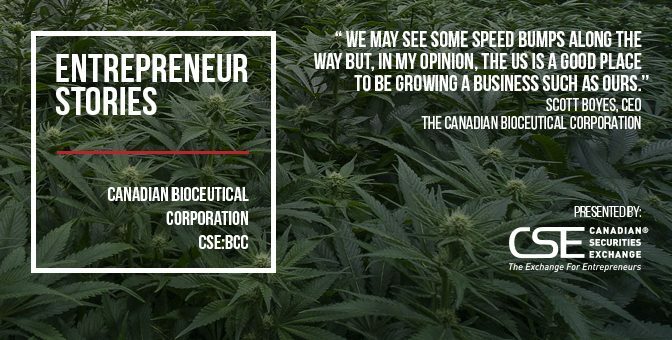 Learn more about Canadian Bioceutical Corporation at http://www.canadianbioceutical.com/ and on the CSE website at http://thecse.com/en/listings/diversified-industries/the-canadian-bioceutical-corporation. 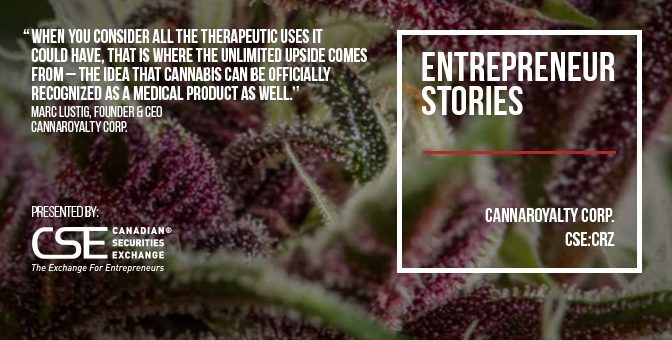 When the first companies focusing on cannabis opportunities started listing on the Canadian Securities Exchange a few years ago, the common model was to submit an application to Health Canada with an eye to producing for the domestic medical-use market. Fast-forward to 2017 and regulatory change in Canada, plus some 29 US states and the District of Columbia, is creating new business opportunities in what is beginning to take on the guise of an international market. For CannaRoyalty Corp. (CSE:CRZ), it’s 25 opportunities so far, or at least that is the number of holdings the company has acquired to date. Run by founder and CEO Marc Lustig, former head of capital markets for investment banking powerhouse Dundee Securities, CannaRoyalty looks on both sides of the border for investment opportunities with the potential to contribute a dependable stream of cash flow. Candidates are put through a strict due diligence process and those making the cut are offered capital under a set of terms tailored to fit their business, along with guidance from CannaRoyalty that has proven valuable in helping investee companies deploy that capital to boost growth. A quick perusal of the CannaRoyalty portfolio shows that royalty agreements often come alongside equity stakes in a business, which enables CannaRoyalty to be more hands-on than would be the case if it were merely receiving a percentage of revenue. Resolve’s Breeze vaporizer provides users with a metered dosage of cannabis using a sealed pod that is inserted into the device. Usage can be monitored through an app that works via bluetooth on smartphones, thus providing accurate information for the patient and supporting health care professionals. Lustig refers to the Anandia investment as the “picks and shovels model,” whereby rather than investing in producers themselves, CannaRoyalty favours businesses that make products cultivators need to grow cannabis effectively – moving up the value chain as compared to cultivators whose product is at risk of becoming a commodity. 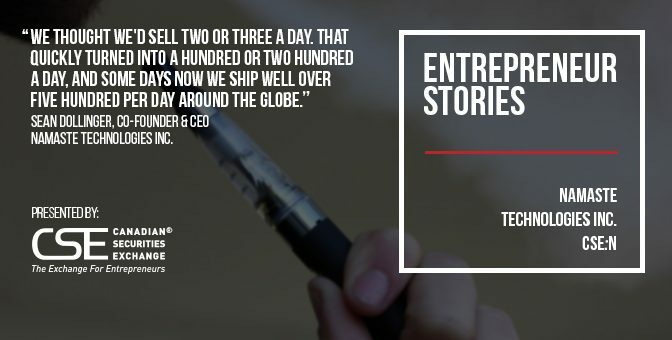 At the other end of the ownership percentage spectrum, CannaRoyalty owns 100% of DreamCatcher Labs, which Lustig describes as one of the largest companies designing vaporization pens and cartridges. Hardware designed and manufactured by DreamCatcher is sold to other companies on a private label basis, with one model in particular also used for CannaRoyalty’s own GreenRock Botanicals brand. Lustig’s personal interest in the cannabis industry developed through his work at Dundee, and he had an edge in understanding the potential of the fast-changing sector thanks to his molecular biology degree and start in the pharmaceutical industry, prior to moving into capital markets for his career. 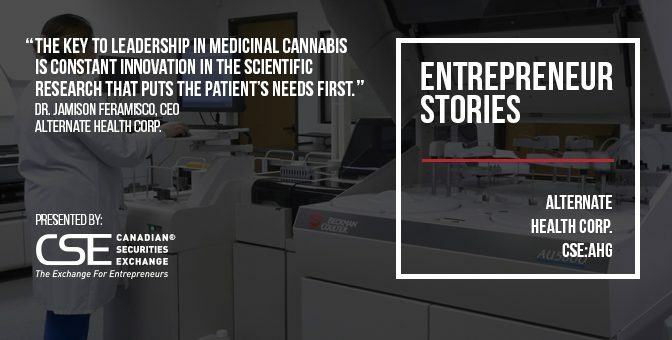 In 2014, when Canada allowed companies to set themselves up as entities producing commercially for the medical-use market, the overnight change in investor sentiment opened the banker’s eyes to a new opportunity. As for CannaRoyalty in the near term, Lustig says investors can anticipate more deals bringing cash flow and strategic synergies, some in markets where CannaRoyalty does not currently have a presence. Jurisdictions in which the company already has portfolio holdings include Canada, Washington, Oregon, California, Arizona and Puerto Rico. Before long, all of this is expected to culminate in an attractive bottom line. “Investors should view our portfolio as a diverse mix of income and asset growth in the cannabis market,” Lustig concludes. This story was originally published at www.proactiveinvestors.com on May 2, 2017 and featured in The CSE Quarterly. Learn more about CannaRoyalty at http://cannaroyalty.com/ and on the CSE website at http://thecse.com/en/listings/diversified-industries/cannaroyalty-corp. The precise number depends on the source you choose, but multiple surveys indicate that people spend hundreds of millions of hours playing video games every week. And that’s just in North America. Considered another way, the Super Bowl and its famously expensive commercials attract around 110 million viewers in the United States, yet that occurs just once a year. Clearly, then, video games are media – and immersive media at that – with millions of people engaged at any given moment. And most players pack enough disposable income that brands want very much to reach them. The billion-dollar question is how to introduce a level of commercial marketing into the gaming environment such that it makes a positive impression on behalf of a brand, as the last thing you’d want to do is turn gamers off by being intrusive or annoying. 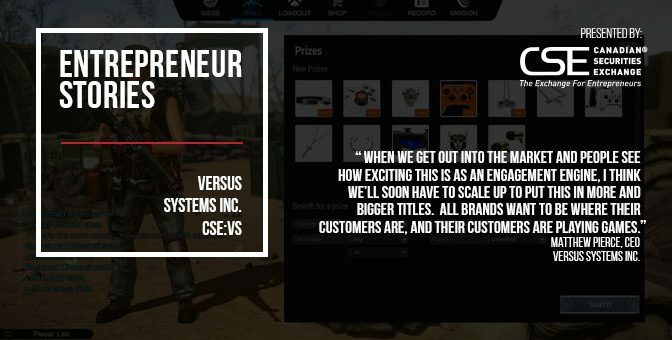 Versus Systems (CSE:VS) is confident it has the answer, and it revolves around encouraging both avid and casual gamers to opt into an environment where products and brands are featured in a way such that players become eager to interact. Gamers are naturally competitive, so the idea of offering the chance to play for more than just an ephemeral digital points total makes sense. Playing for valuable prizes introduces a new degree of meaning to the activity, and it is this dynamic that is enabling Versus Systems to draw interest from an increasing number of brands searching for new ways to market their products. “We’ve created a platform that does two things,” explains Versus Systems CEO Matthew Pierce. “First, it allows publishers and developers to offer prizes within their games to drive engagement. It makes them more fun to play and the idea that you can compete for everything from downloadable content to physical goods to energy drinks and concert tickets is an enormously powerful opportunity. The origin of Versus Systems is a fascinating story and helps explain not only where the core idea came from, but why the company is positioned to succeed in a business with immense challenges, both technical and legal. Pierce is a Stanford graduate who started his own companies and worked for large consulting groups. Versus Systems was founded in a technology incubator Pierce worked in, but it was an incubator with a twist. Not only was it full of programmers and engineers with incredible skills and entrepreneurial zeal, but its main backer was a law firm, and this is the team’s secret sauce, if you will. Players who want to compete on the Versus platform must first download an app to their phone or computer so they can log into the community. Once in, a player finds that the Versus experience is additive and does not interfere with their fun by adding the conventional overlay of monetization approaches common to many games these days. Rather, Versus enables players to determine the parameters of interaction themselves. The beauty of the business model from the Versus Systems perspective is that the company does not have to make large financial outlays in order to attract users to its platform. As it aligns with popular games, players will naturally find Versus and its competitive options on their own. For game developers, the appeal is a platform that is a total solution, managing prize and competition details for players, while also addressing administrative challenges they surely would rather have someone else take care of. Versus generates a number of revenue streams from its involvement with each game, the most important being revenue-sharing agreements with developers and publishers when brands pay to offer products or gamers choose a pay-to-play option from the platform. Integration fees help the company cover up-front costs. Pierce and his team are currently working to integrate the beta model of the platform into a handful of games, while at the same time adding prize providers and signing up brands, some of which he expects to be very big names. Rapid expansion of the company and its reach is expected to follow. 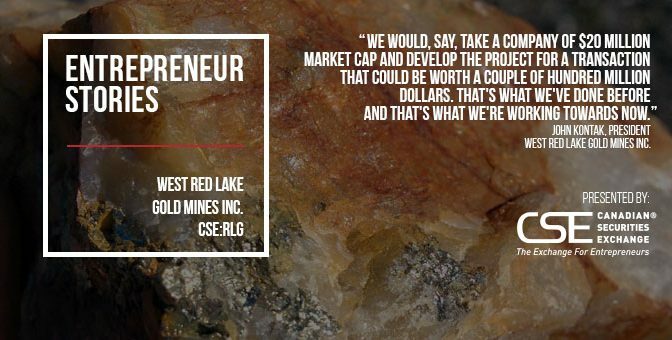 This story was originally published at www.proactiveinvestors.com on Mar 1, 2017 and featured in The CSE Quarterly. Learn more about Versus Systems at http://www.versussystems.com/ and on the CSE website at http://thecse.com/en/listings/technology/versus-systems-inc.
Getting in on the ground floor of an exciting new opportunity is one well-acknowledged path to success. 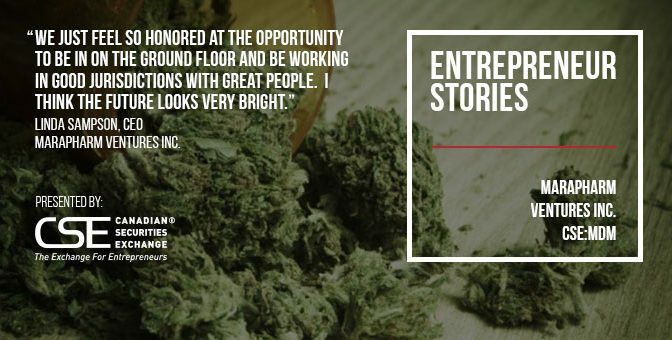 Marapharm Ventures (CSE:MDM) CEO Linda Sampson likens it to finding a “once in a lifetime opportunity” and believes that is exactly what her company is moving forward with as it draws closer to operations at multiple facilities focusing on the medical cannabis industry. Marapharm is taking a different approach than many of the other companies in the space, diversifying its portfolio across geographic regions and business types, and doing so in a way that marries its corporate strengths with the needs of different markets. It is a plan that at once helps manage risk while increasing the degree of success Marapharm and its shareholders can potentially realize. Marapharm is advancing cannabis production opportunities in British Columbia and Nevada, and will also serve as landlord of a large facility in Washington State. It plans to not only grow cannabis but also process harvested material into products such as oils and edibles in jurisdictions where this is permitted. Production, processing, landowner, future retailer – put a check mark in the vertical integration box. Fortunately, when it comes time to ship product, Marapharm’s boss is an experienced marketer. Sampson, originally from South Africa, enjoyed a career before agreeing to head Marapharm that saw her re-brand struggling companies and help turn their operations successful in relatively short order. Sampson also worked with commercial property developers to conceptualize projects, consult with designers to ensure details were right, and market them afterward. Sampson’s skillset is being put to good use at Marapharm, which leans on her for real estate, market research, and strategic planning insight to name just a few challenging aspects of the fast-moving, big money industry that is medical cannabis in North America. 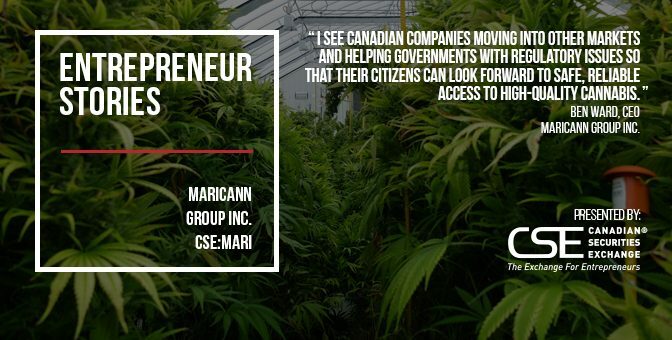 Marapharm has an application before Health Canada for a production facility in the picturesque city of Kelowna – also home to Marapharm’s head office – that has passed the Security Clearance phase and is now in the in-depth Review phase. But moving faster thanks to different local rules are facilities in the US state of Nevada. Here, Marapharm is looking to be a major player in the Las Vegas market for medical, and soon recreational, cannabis and processed cannabis products. The holder of the latter license is businessman Kurt Keating, an award winning organic cannabis grower who will work with Marapharm on its Nevada projects as general manager. But Keating’s role does not end there. Being a Washington resident, Keating obtained a license in that state and will use it to operate a facility that would be situated on 13 acres of land Marapharm has the option to purchase. It already accommodates a 28,000 square foot building used as a cultivation facility and the plan is to expand that footprint. Companies from outside of Washington State are not permitted to hold local growing licenses, and with Marapharm hailing from Canada that means it can’t be the licensed grower at the Washington site. The strategy is thus to purchase the land, build and outfit the facility, then lease it to Keating and other growers for their own production use. A departure compared to being the actual grower, but still a use of capital that generates a good return and diversifies both the company’s asset holdings and revenue model. Looking out over the next 12 months, Marapharm intends to forge ahead with its application in Canada while completing the build-out at its Washington site. In Nevada, the company wants to get production up and running sooner and use its processing facility to create edibles and other products suited to the local market. “We anticipate that the Nevada market will be more focused on processed products as opposed to the actual cannabis, as they can be used more discreetly,” says Sampson. Reflecting the different regulatory atmosphere, the Nevada sites actually face April deadlines to begin operating, so Marapharm is working to have initial 5,000 square foot facilities functional on each within the prescribed time frame. “They are OK with us having a smaller building but with the intent to move ahead with a bigger structure at a later date,” Sampson says. So, big plans and tight timelines, but how is Marapharm set to manage financially? To begin with, the Nevada land is paid for and the company does not have any debt, plus warrant exercises brought in over $1.5 million as the stock price topped the $2.00 level in November. The stock trades good volume between $1.00 and $2.00, which suggests the company has financing options that would not require it to accept undue dilution if it needed to go to market. Marapharm also has designs on California, not to mention automated vending machines, that, using proprietary biometrics for identification purposes, would be used where regulations allow. It is a strategy of diversification, integration, but focus on a young, growing cannabis industry – the pieces appear to fit. This story was originally published at www.proactiveinvestors.com on Feb 23, 2017 and featured in The CSE Quarterly. Learn more about Marapharm Ventures at http://www.marapharm.com/ and on the CSE website at http://thecse.com/en/listings/life-sciences/marapharm-ventures-inc.